Although never occurring in large numbers, the American peregrine falcon was once found throughout the Appalachian Mountains of the eastern United States. In 1942, the known nesting population east of the Mississippi was estimated at around 350 pairs. Nesting in Virginia was known from 24 sites in the Allegheny and Blue Ridge Mountains and from 2 sites along the coast, in tree nests made by other birds. After World War II, the widespread use of organochlorine pesticides such as DDT, in conjunction with human disturbance, contributed to abrupt and widespread population declines of the falcon. DDT led to the bioaccumulation of toxic residues in prey species, in turn contaminating the falcons and reducing the viability of their eggs. This resulted in the falcon’s probable extirpation as a nesting species from Virginia and the eastern United States by the mid-1960s. The American and Arctic peregrine falcon subspecies were listed as endangered by the U.S. Fish and Wildlife Service (USFWS) in 1970. Between 1975 and 1979, an Eastern Peregrine Falcon Recovery Team appointed by the USFWS developed a federal Recovery Plan whose main objective was “to restore a new self-sustaining population of peregrine falcons in the eastern United States.” The plan called for protecting and managing essential nesting, wintering, and migration habitat; eliminating the environmental pollutants that originally caused most of the population declines (DDT was finally banned in 1972); protecting peregrines through law enforcement; implementing an education program to build public support for and understanding of peregrines; and releasing captive-produced falcons into the wild. Although all facets of this comprehensive strategy have been implemented in Virginia, below we focus on two aspects specifically that have been critical to the comeback of the peregrine falcon in the Commonwealth: the release of young peregrines into the wild, and surveys and monitoring of the growing peregrine population. The primary method used to reintroduce falcons to the wild is called “hacking”. This process involves placing 28-30 day-old birds into a protective box at a release site. Food is provided daily in the form of domestic quail or chicken, and interactions with humans are kept to an absolute minimum. Ten to 15 days later, when the young falcons are able to fly, the box is opened and the birds released. Food is provided until the birds are able to hunt successfully. To provide a source of young birds for release, a captive breeding facility was established in 1970 at the Laboratory of Ornithology at Cornell University, and the first young falcons were produced in 1973. Peregrine reintroduction in the eastern U.S. began the following year. Through efforts under the Recovery Plan, the Arctic peregrine recovered sufficiently to be delisted in 1994, and the American subspecies in 1999. 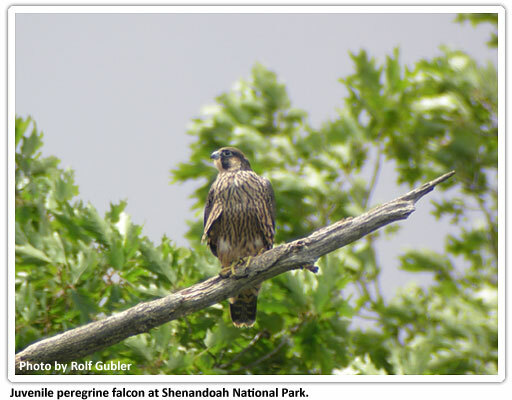 Because falcons have not recovered as a nesting population in their historic mountainous range within Virginia, they remain listed as a Threatened Species under Virginia’s Endangered Species Act and regulations enacted by VDGIF. The current Virginia falcon population is heavily managed and not yet self-sustaining. Repair, replacement and creation of new towers and nesting structures on the coast, translocation and hacking of chicks in the mountains, parasite control and other actions are all necessary to ensure the continued nesting success of Virginia’s falcons into the foreseeable future. The current objectives of VDGIF and our partners are to maintain a stable coastal population and continue efforts toward recovery of the mountain breeding population.